We’d love your help. Let us know what’s wrong with this preview of Jesus and the Land by Gary M. Burge. To ask other readers questions about Jesus and the Land, please sign up. I really enjoyed this book, and right after I started reading it I noticed two other authors I respected had also recently made mention of it, so I figured it should be a good read. The issue of Zionism, or those who feel Israel deserves to be back in their land due to some biblical, covenantal, or eschatological reason, really need to examine the issue further; and this book is a great place to start. I was thinking it was going to just be a book to counter the many modern arguments in support I really enjoyed this book, and right after I started reading it I noticed two other authors I respected had also recently made mention of it, so I figured it should be a good read. The issue of Zionism, or those who feel Israel deserves to be back in their land due to some biblical, covenantal, or eschatological reason, really need to examine the issue further; and this book is a great place to start. I was thinking it was going to just be a book to counter the many modern arguments in support of modern Israel, but instead it is a fairly thorough historical march through the Bible, covering the covenant, the promises, and the importance of the land along the way. Most of the way through, it spoke so much in favor of the importance of the land, that I thought it was going down a path other than what I thought the intent was. Then as he approached the New Testament, and the new covenant, the shift began, and the last couple chapters examine the view of the land in those last days for the Christians. Kenneth Gentry recently commented, saying this book is one of a few books that has greatly shaped his view of Israel and the land, and that after reading this and the couple others, if someone still could cling to a modern dispensational view of the land, then they are probably beyond hope (that is a paraphrase as I understood it). I pushed myself hard to finish a book that tears at the foundation of who I am and what I believe as a messianic Jew. Gary Burge is well known as an anti-Israel evangelical who often aligns himself with Palestinian theologians who cry out at the alleged injustices of Israel towards the Palestinians and at the same time ignore the mistreatment of Palestinian Christians at the hands of Muslim Hamas. Several points need to be stated about Burge’s expose of what he calls territorial theology. First, B I pushed myself hard to finish a book that tears at the foundation of who I am and what I believe as a messianic Jew. Gary Burge is well known as an anti-Israel evangelical who often aligns himself with Palestinian theologians who cry out at the alleged injustices of Israel towards the Palestinians and at the same time ignore the mistreatment of Palestinian Christians at the hands of Muslim Hamas. First, Burge carefully quotes passages from the Torah which describe God’s giving of the land of Israel as well as the scattering of Israel from the land upon their disobedience to the Torah. However, Burge neglects to include passages from the Tenach in which God promised to restore Israel back to the land. The author did this quite frequently which makes his theology disingenuous. Second, like the first point, Burge, a NT Johannine scholar failed to demonstrate any comprehensive grasp of the multitude of OT prophetic passages which prophesied Israel’s return to the land after the 70 AD destruction of the temple and the worldwide exile of Israel. Like the majority of supersessionists or replacement theologians, he did not dare try to exegete passages from the prophets that contradicted his tightly wound anti-Israel theology. This is most likely the downfall of his book. Third, Burge is truly a gnostic Christian theologian who makes Jesus out to be the Gnostic Messiah of the anti-materialistic Hellenists. According to the former Wheaton professor, there are no more land promises since Jesus is the land. In addition, there is no need for a physical temple in Jerusalem since Jesus as well as His followers are the Temple of God. Regardless of all the OT prophetic passages that speak of the millennial Temple, or the centrality of Jerusalem in the messianic kingdom or the restoration of Israel to the land, according to Gary Burge, these physical realities have been replaced by the Gnostic Christ of Gary Burge. At times I thought I was reading one of Plato’s works. Last, Burge, a NT exegetical expert, did a suspect job interpreting key passages in the NT regarding Israel. According to Burge in Matthew 5:5, “blessed are the meek, for they shall inherit the earth or the land,” Jesus was telling His Jewish followers that only those who are meek and humble will be given the land of Israel. Of course, later in the book, Burge dispels the promises regarding the holy land and replaces it with heaven. But nowhere in the Sermon on the Mount is Jesus discussing any territorial issues let alone Israel’s inheritance of the land. ‘Earth” might refer to earthly authority and Jesus is telling His followers that authority in earth and rulership in this world is not through grabbing and force but humble dependence on God. To interject the provisions of the Abrahamic Covenant into Jesus’ teaching at this juncture in Jesus’ ministry is bad eisogesis by Burge. The list goes on through Romans, Galatians, Hebrews and Revelation where the author misinterprets scripture to do away with any suggestion that the land of Israel had any significance to first century messianic Jews. This is one of those books that, if you agree with it, you don’t need to read it. A few simple sentences would suffice to reimburse the conclusions you have already come to. Well, I suppose it is worth reading if you are gearing up for an argument with people who don’t agree. And, I suppose, it would do well to arm up on the whole book's worth of arguments, knowing the kind of people who would argue in opposition. For sure, this is not the kind of book for people who don’t agree. They simply won This is one of those books that, if you agree with it, you don’t need to read it. A few simple sentences would suffice to reimburse the conclusions you have already come to. Well, I suppose it is worth reading if you are gearing up for an argument with people who don’t agree. And, I suppose, it would do well to arm up on the whole book's worth of arguments, knowing the kind of people who would argue in opposition. For sure, this is not the kind of book for people who don’t agree. They simply won’t read it. That’s just how people are. And if they do read it but don’t already agree with the basic idea, they’ll give it one star. That’s just the nature of this topic. It would take a faith-shattering, doubt-inflicting experience to force somebody to rebuild their belief system along the opposite pole of this argument. That being said, I suffered one such pole-shift a decade ago, which led me to a much deeper understanding of Christ’s mission here on Earth and God’s will for humanity. Having been born amongst those who think Jerusalem lies at the center of the universe, it was a complete one-eighty for me to realize that God is bigger than a box on top of a mountain—even a box made of gold and housed in a pretty little temple. God’s plan is not to be owned by a few people, nor to favor a single tract of land while shunning all others. The God I have come to understand is one who does not hide His truth from those who seek Him…whether they are inhabiting the “Holy Land” of Israel or living in darkest Africa or ancient China or the Jungles of Central America. As this book clearly points out early on, it is the nature of man to want to favor a land. Those who do not understand this might just be surprised to find that they are the ones who have failed to fully understand the teachings of Jesus. Burge's extreme angle on this critical issue is the result of serious errors. Inadequate time was spent addressing the philosophical ramifications of God's initial choosing and blessing of Israel. Burge's humanism that protests God's promises to Israel would fall flat if these issues were addressed. His argument that God's focus moves away from the Land in the New Testament comes from a failure to understand the age we live in (The time of the Gentiles, Luke 21:24), as well as what the Land repr Burge's extreme angle on this critical issue is the result of serious errors. Inadequate time was spent addressing the philosophical ramifications of God's initial choosing and blessing of Israel. Burge's humanism that protests God's promises to Israel would fall flat if these issues were addressed. His argument that God's focus moves away from the Land in the New Testament comes from a failure to understand the age we live in (The time of the Gentiles, Luke 21:24), as well as what the Land represents for Israel (It is more than just land!). Burge simply neglects all of what the Scriptures have to say about the conclusion of this time, seriously damaging his ability to speak to this issue with any credibility. Great, sweeping look at the role of the land in the Bible and how it is presented and understood. The book deals pretty strictly with the biblical aspect, without delving into the politics and present-day problems, although the author does recommend lots of wonderful books on both sides of the aisle. This is an excellent example of good Biblical scholarship that helps us to understand the world of scripture and speaks a relevant word to real world situations now. Whether you find yourself in agreement with the author politically there is much here to contemplate and consider. An excellent resource. A thorough overview of many, many texts in play on this issue. Does a fantastic job of clarifying the NT's vision of what Jesus accomplished and how it supersedes any theology tied to land. This is a lot of work packed into a quick 130-page read and easily could have been 500. Very good introduction to the relevant passages, though. I wish all American Christians would read this. 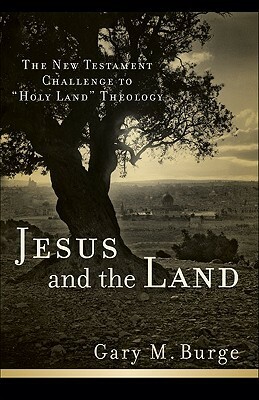 Excellent look at NT theology concerning the Land (Israel) which brings challenge, balance, and perspective to the popular Zionist movement and lays out an understandable template for understanding how Christ fulfills and expands OT promises and intentions. With all that's going on in the Middle East, it's good to read a healthy Biblical perspective about the Land where Jesus walked. amazing theological refutation of Christian Zionism - so well written and so well argued! Dr. Gary M. Burge is a professor of New Testament Studies at Wheaton College, where he has been on staff since 1992. "When Lebanon's tragic civil war broke out in the early 1970s, I was a student at the American University of Beirut studying politics and Islam. I never realized what an indelible mark this y Dr. Gary M. Burge is a professor of New Testament Studies at Wheaton College, where he has been on staff since 1992. "When Lebanon's tragic civil war broke out in the early 1970s, I was a student at the American University of Beirut studying politics and Islam. I never realized what an indelible mark this year would put on me as this dangerous national tragedy unfolded before our eyes. Since the university witnessed sporadic closures, I began studying at Beirut's Near East School of Theology (an Arab-Armenian seminary) and there for the first time was exposed to the technical study of the New Testament (under the guidance of Dr. Kenneth E. Bailey). It seemed that from here my life found its twin navigational markers: the New Testament and the world of the Middle East. Following graduation from Fuller Seminary in 1978, I completed a Ph.D. in New Testament at King's College, Aberdeen University, Scotland, under Professor I. Howard Marshall. In 1987 my research was published as The Anointed Community, The Holy Spirit in the Johannine Tradition (Eerdmans) and this launched a longstanding interest in the literature of John which continues to this day (see bibliography). But in addition, I have also retained my passion for the Middle East. Here too there has been evolution and specialization. Teaching the historical geography of Israel on site has today become a specialized interest in New Testament Galilee. But in addition, I have had the good fortune of being befriended by many Palestinian Christian pastors and learning with dismay about the suffering of the Palestinian church in modern Israel. In 1993 I wrote a study of this dilemma entitled, Who Are God's People in the Middle East? (Zondervan). I have also become active in an evangelical advocacy group, Evangelicals for Middle East Understanding, which works to facilitate dialogue between Arab and western church leaders. In 2003 I wrote a second, more thorough volume on Palestine entitled, Whose Land? Whose Promise? What Christians Are Not Being Told About Israel and the Palestinians (Pilgrim Press).